The share of sovereign currencies in mutual trade within the Shanghai Cooperation Organization (SCO) should be increased to reduce dependence on international reserve currencies, President Medvedev has said. He spoke in the Russian city of Yekaterinburg, where SCO members (Russia, China and four ex-Soviet Central Asian republics – Kazakhstan, Kyrgyzstan, Tajikistan and Uzbekistan) have gathered for a two-day summit. “We must strengthen the international currency system not only by strengthening the dollar's position, but also by creating new reserve currencies and possibly by eventually creating supranational payment instruments and means of settlements,” he said, adding that regional countries could invest in each other's financial instruments. Speaking at a media conference, Medvedev noted that the Russian Ruble may one day become a regional reserve currency within the SCO and on a wider level. “As far as the supranational currency is concerned, all the parties stressed quite an obvious thing – the existing reserve currency baskets and the major reserve currency – the dollar – did not live up to the hopes,” he added. However, a new supranational currency would need “the consensus of all the nations on that” and would require time, the Russian president pointed out. “A supranational global currency for the world is a really complicated issue. Unity is needed on this among all the countries involved. We’ve repeatedly spoken about this in the framework of the G20: that through the system of the International Monetary Fund – considering the amount of money the IMF is distributing – we’ll be witnessing the emergence of a new supranational currency used for international settlements,” Medvedev said. Presidential aide Arkady Dvorkovich told RT that the world economy will benefit from more strong reserve currencies. “Russia is a part of the global economy. We have part of our reserves in dollars, part of our trade in dollars. We hope that the dollar will be a strong currency. But we believe that the world economy will benefit from more strong reserve currencies that will serve international trade, investments and financial markets,” Dvorkovich said. RT business editor Mark Gay says the crisis has revealed the vital necessity for a new reserve currency to replace the dollar. “It was the crisis that began in the US, but because everybody is using the dollar for trading in oil, trading in gold, trading in property – the effects of the US crisis hit everyone. The US crisis rumbles on and a lot of countries have their investments held in dollars – all their reserves, their foreign exchange reserves, all the profits that they make from exporting – at least a very large proportion of them are. So if the US economy continues to struggle and the dollar falls, then the wealth of Japan, Russia, and China would all be at risk. So they are looking up ways to get their assets out of dollars,” Mark Gay says. Nevertheless, the reserve currency is not something that you can proclaim – this is what develops over time, as Lynn Pascoe, UN Under-Secretary General for Political Affairs, said to RT. "There is SDR, Special Drawing Rights, in the IMF, and I must say that they don’t work that well for this sort of a process – they work in terms of allocating what you have to do. But currency is very much of a free-market operating thing, and frankly, if it is more beneficial for the world to move away from Dollars, they will – but they move back and now they moved much more towards the Dollar and sort of away from the Yen and the Euro in some respect," he said. The SCO summit has been followed by a meeting of the BRIC leaders (Brazil, Russia, India and China). The world's leading emerging economic powers have agreed to cooperate to strengthen financial and energy security during the ongoing economic crisis. “Our task is to strengthen and build on our collective mechanisms to strengthen the rule of law around the globe. We mentioned during our meeting that all important decisions for the international community – economic, security and political decisions – should be taken on a fairer basis and this fairness is the key word for our interaction,” President Medvedev said after the BRIC meeting. During the meeting, the leaders of Brazil, Russia, India and China agreed to define parameters of the new global financial structures at the Yekaterinburg summit on Tuesday, President Dmitry Medvedev said. The BRIC countries see themselves as a major driving force for the global economy. 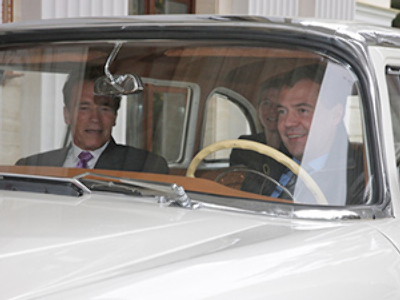 President Medvedev has said that they all have the potential for robust growth. "We will consider parameters of the new financial architecture. We will order our finance ministers, central bank heads and other relevant departments to draft their proposals. We will thoroughly study these proposals and make them come true in case of approval," Medvedev said. 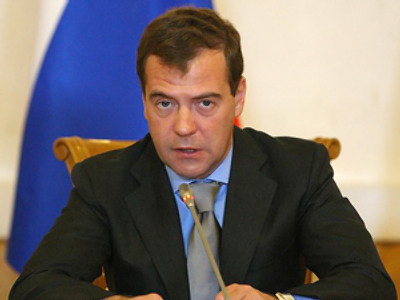 Dmitry Medvedev's call for the creation of a new trans-national currency was high on the agenda. In a joint statement, the BRIC leaders have also urged to assign the responsibility for developed and developing countries to solve the problems of food security. “Developed countries should lend financial and technological support to developing countries in the area of food production,” the statement says. The BRIC leaders have also condemned terrorism in all its forms and called for the quickest adoption of a universal UN convention on international terrorism. The next summit of BRIC countries will take place in Brazil in 2010, according to a joint statement by the leaders of Brazil, Russia, India and China. Experts say the BRIC summit is something of a test for Brazil, which some call the "odd one out" of the group, partly because it has the slowest growing economy of the four nations. Its economy expanded at about half the rate of China and India over the past decade, and it’s about two-thirds behind the growth rate of Russia. It is also the only non-nuclear power of the four. On Tuesday, the summit participants decided to grant observer status to Belarus and Sri-Lanka. Russia's president urged for documents to be drawn up setting out rules for admitting new members to the Shanghai Cooperation Organization (SCO). “We need to speed up work on the draft documents regulating the admission of new members to the organization. We have been discussing the issue, and are unanimous on this,” he said. The SCO currently has no official arrangements for admitting new members. Iran and Pakistan, observer nations in the group along with India and Mongolia, have recently asked for full membership. Russian officials have said the group's enlargement is being held back by a lack of admission rules, but China has warned against excessive expansion, saying it could hinder cooperation. The SCO leaders have signed a Yekaterinburg declaration and an SCO counter-terrorism convention. Along with these, the participants of the summit concluded agreements concerning the training of anti-terrorist groups of the member states, and cooperation in the field of international information security. It has been agreed the next SCO will take place in 2010 in the Uzbek capital Tashkent.